Grand Junction- Peter Gorog spent a majority of 1944 in the confines of a basement avoiding bombing raids where he lived in the Budapest ghetto. Later this month, Gorog will spend time on the campus of Colorado Mesa University. As one of the few remaining Holocaust survivors, while on campus he will remind the next generation of Americans that the Holocaust and genocide are issues of today — not to be relegated to history. As a volunteer at the United States Holocaust Memorial Museum, Gorog works to keep lessons learned from the Holocaust on the minds of people. As a man who survived history’s most egregious genocide, he remains a living legacy to perseverance and the hope that humankind may overcome future atrocity by learning from the past. 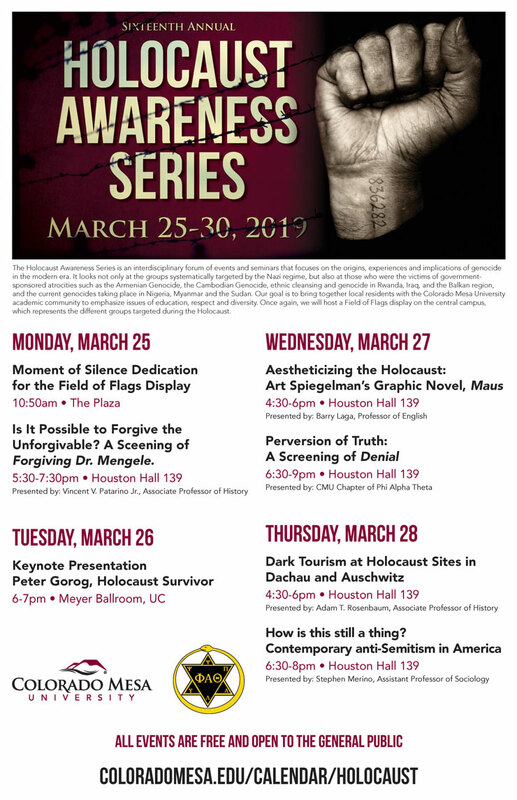 Gorog will visit CMU as the university hosts the sixteenth annual Holocaust Awareness Series the week of March 25, 2019. Associate Professor of History Vincent Patarino, PhD, is the series coordinator and is a tireless advocate for Holocaust awareness. 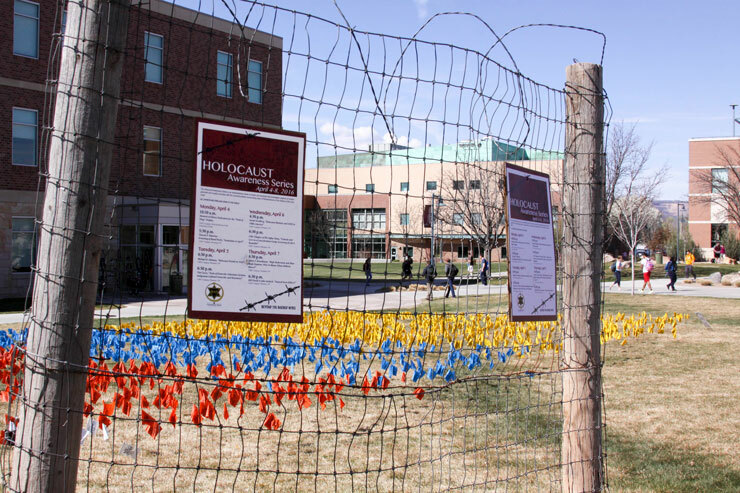 While visitation of a Holocaust survivor always captures the attention of a campus community, the series is also garnering accolades outside of CMU. James Kurtz-Phelan is the past chair of the Anti-Defamation League Mountain States Board of Directors and believes events like the one at CMU are critical for ensuring future generations don’t lose site of history’s cautionary tale. 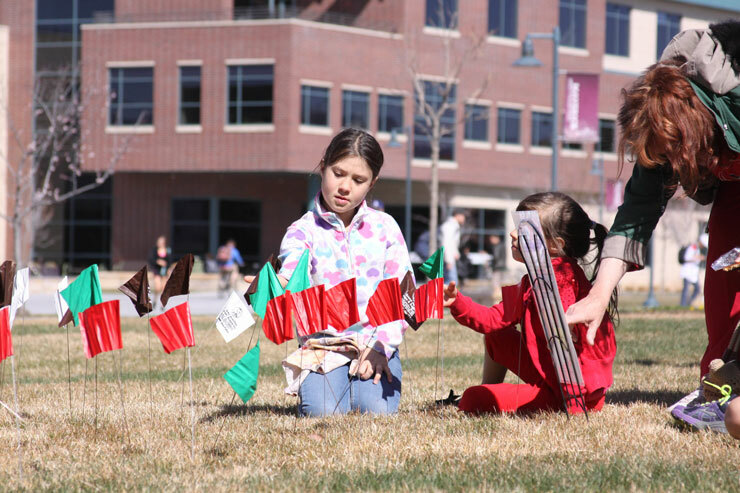 The series begins on Monday, March 25, with a field of flags display followed by a film screening. The field of flags display will contain more than 2,500 flags and each one represents 5,000 lives killed by the Nazis in concentration camps during World War II. On March 26, Peter Gorog will provide a keynote presentation with additional film screenings, lectures and discussions occurring through the remainder of the week. The films, lectures and discussions will be made available to be public through CMU’s Civic Forum website — an effort appreciated by the Anti-Defamation League (ADL). ADL is a national anti-hate organization working around the world to stop the defamation of Jewish people, and to secure justice and fair treatment for all. While the event’s theme is Holocaust awareness, the coordinators believe the mission and objectives of the series are more broad. The series will also explore not only the groups systematically targeted by the Nazi regime, but also those who were the victims of government-sponsored atrocities such as the Armenian Genocide; Cambodian Genocide; ethnic cleansing and genocide in Rwanda, Iraq, and the Balkan region; and the current genocides taking place in Nigeria, Myanmar and the Sudan. CMU invites the public and media to attend the series and notes that lectures and presenters will be available for media interviews throughout the course of the week.